You can go get it here. You can download a free trial to try first here. It's nice that Adobe allows you a free trial version first before deciding if you want to purchase it. I think this is the most significant upgrade for Photoshop yet. You can read my review on the new software from a few weeks back here. More from John Nack on the release here. Full press release from Adobe on the product below. The Adobe CS5 product family is powering the creation of content and applications for the upcoming releases of Flash® Player 10.1 and Adobe AIR® 2, which are optimized for high performance on mobile screens and designed to take advantage of native device capabilities for a richer, more immersive user experience. Featuring integration with online content and digital marketing measurement and optimization capabilities for the first time, Creative Suite 5 products include access to signature Omniture® technologies, to capture, store and analyze information generated by websites and other sources. Adobe Creative Suite 5 products also integrate with Adobe CS Live*, a set of five innovative online services that accelerate key aspects of the creative workflow and enable designers to focus on creating their best work (CS Live services are complimentary for a limited time). The Creative Suite 5 products offer more than 250 new features that embrace interactivity, enhance performance and maximize the impact of creative content and digital marketing campaigns. InDesign CS5 powers the transition to digital publishing with new interactive documents and enhanced electronic reader device support. 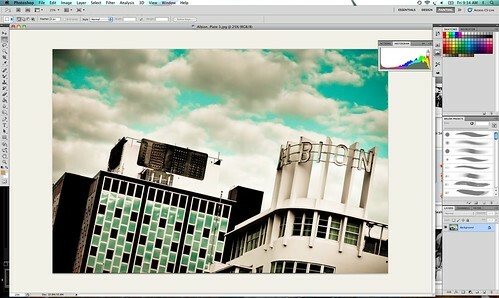 Image creation and editing get a boost with Truer Edge technology in Photoshop CS5, which offers better edge detecting technology and masking results in less time. Photoshop CS5 also includes the ability to remove an image element and immediately replace the missing pixels with Content-Aware Fill. New stroke options allow Adobe Illustrator CS5 users to create strokes of variable widths and precisely adjust the width at any point along the stroke. New Text Layout Framework in Flash Professional CS5 provides professional-level typography capabilities with functions like kerning, ligatures, tracking, leading, threaded text block and multiple columns. In addition, Dreamweaver CS5 now supports popular content management systems Drupal, Joomla! and WordPress, allowing designers to get accurate views of dynamic Web content from within the product. Adobe Creative Suite 5 products integrate with Adobe CS Live*, a set of five online services that accelerate key aspects of the creative workflow and enable designers to focus on creating their best work. CS Live online services are complimentary for a limited time and currently include: Adobe BrowserLab, Adobe CS Review, Acrobat.com, Adobe Story and SiteCatalyst® NetAverages™ from Omniture. Adobe CS Review enables online design reviews from directly in Creative Suite 5 applications, while Adobe BrowserLab is an indispensable tool for testing website content across different browsers and operating systems. NetAverages provides Web usage data that helps reduce the guesswork early in the creative process when designing for Web and mobile. Adobe Story is a collaborative scriptwriting tool that improves production and post-production workflows in CS5 Production Premium. Access to Acrobat.com services, such as Adobe ConnectNow Web conferencing, is also included to enhance discussion and information exchange with colleagues and clients around the globe. Using Flash Professional CS5, designers and developers can create, test and deliver Web content across a wide range of mobile platforms and devices such as smartphones, tablets, netbooks and other consumer electronics. Users can look forward to deploying content in the browser with Flash Player 10.1 and as a standalone application with AIR 2. Adobe Creative Suite 5 products and its associated point products will be available through Adobe Authorized Resellers, Adobe Direct Sales and the Adobe Store at www.adobe.com/store. Estimated street price for the suites is US$1899 for CS5 Design Premium, US$1799 for CS5 Web Premium, US$1699 for CS5 Production Premium, US$1299 for CS5 Design Standard and US$2599 for Master Collection CS5. Upgrade pricing, volume licensing and education discounts are available. Adobe CS5 products integrate with Adobe CS Live online services which are complimentary for a limited time. For more detailed information about features, OS support, upgrade policies, pricing and international versions please visit: www.adobe.com/go/creativesuite.